Merry Christmas and Happy Holidays to all! This is the final Rapidly Rotating Records of 2016. THANK YOU for listening and for your support and encouragement through posts to the website and Facebook pages, email and memberships to KISL. I would like to make one request. 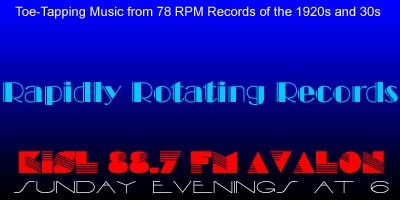 Right now, we are at 592 “Likes” on the Rapidly Rotating Records Facebook page. I would consider it a spectacular Christmas gift to get to 600 by the end of the year. If you are on Facebook, but have not “Liked” the page, won’t you please consider doing so this week? I generally only post once or twice a week with the playlist and links to the show. THANK YOU! On this week’s edition of Rapidly Rotating Records, we have a special birthday celebration for Henry “Bubbles” Reber, whose great-neice contacted me some time ago. We’ll also celebrate the birthdays of Cab Calloway and Nat Shilkret, blow some bubbles and have some songs for the season. When The Morning Glories Wake Up In The Morning – Wisconsin Roof Orchestra / Henry “Bubbles” Reber, v.
Ready For The River – Wisconsin Roof Orchestra / Henry “Bubbles” Reber, v.
Wob-aly Walk – Wisconsin Roof Orchestra / Henry “Bubbles” Reber, v.
I’m Turning My Troubles Into Little Bubbles – Plaza Band (Henry Hudson) / Henry Hudson, v.
Floating On A Bubble – Abe Lyman AHO / Sonny Schuyler, v.
I’m Bubbling Over – Skeeter Palmer AHO / Skeeter Palmer, v.
Gotta Darn Good Reason Now (For Bein’ Good) – Cab Calloway AHO / Cab Calloway, v.
Hotcha-Razz-Ma-Tazz – Cab Calloway AHO / Cab Calloway, v.
Some Sweet Day – Nat Shilkret and the Victor Orchestra -/ Johnny Marvin, v.
The Fairy On The Christmas Tree – BBC Dance Orchestra Dir. Henry Hall / The Three Sisters, v.